Your backpack is of the utmost importance when assembling a Bug-out bag. It needs to be durable, comfortable to carry (which means properly fitted to you), versatile, spacious (with room to spare, stuff gets bigger in the field), and ideally provide both environmental and social camouflage. One common debate among ZSers is Heavy vs. Light. In the heavy corner you have those that want to be prepared for everything and be comfortable while doing it. Heavy packers will carry significantly more gear. As such it is important that their packs be very comfortable and durable. In the light corner you have those who aim for speed and agility. Light packers want to be able to get from Point A to Point B quickly and with minimal strain. They are willing to give up most comforts and some useful items if it means they will have a lighter pack. If you choose this strategy you will want a smaller lighter backpack and you will have more choices since you do not need the same degree of support and comfort that a heavy packer does. Internal framing is less visible, less bulky, and also is protected by the pack. Internal frame packs put the packs center of gravity lower, allowing for better balance on rough terrain. External framing generally provides better suspension, but makes for a much bulkier and sometimes a heavier pack. External frames place the center of gravity higher making the load easier to carry but less stable. External frames provide many lash points for additional gear without the need for additional webbing on the pack itself. Frame sheets, while not providing the same quality of suspension, are lighter and less obtrusive than other types of framing. MOLLE, MOdular Lightweight Load-carrying Equipment, is an implementation of PALS (Pouch Attachment Ladder Systems) that was created to replace ALICE. It is essentially a system of webbing that covers a pack, it adds minimal weight while allowing many different compatible pouches and other items to be attached to the main pack. 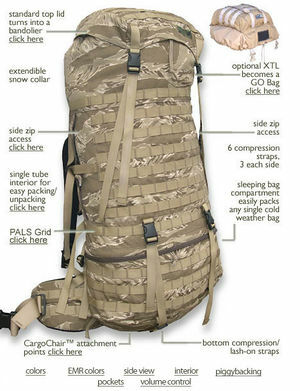 ALICE, All-purpose Lightweight Individual Carrying Equipment, is a system that allows the attachment of pouches and other items to a main pack. It has been superseded by MOLLE. 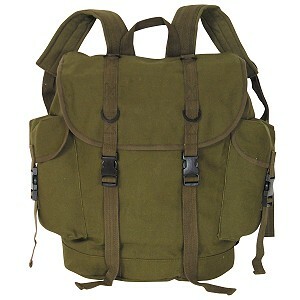 ALICE packs are widely available to the civilian population for extremely inexpensive prices, as military surplus. ALICE packs are available so cheap, and so rugged, they are arguably the most pack for your dollar you can get, and are an excellent choice to build your first BOB with. Most decent packs come with external compressions straps which will allow you to compact the size of the bag. This will prevent all your gear from moving around, and allow you to have more stability when hiking. There are many excellent options for a good pack, but these are some of the more popular packs that are available. The ALICE pack offers excellent bang for the buck, being rugged, spacious, and inexpensive. Kifaru military packs are generally considered to be the "creme de la creme" of packs. They have many unique features in addition to being light, durable, and available in many different sizes. Kifaru packs also tend to be the most expensive pack. 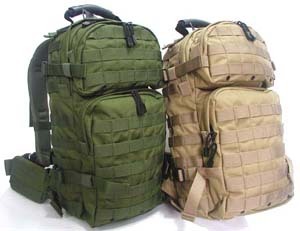 MOLLE Packs are available in many configurations from many companies. Some people store part of their Bug Out Gear into something other than a backpack. This page was last modified on 29 March 2014, at 15:37.